Simply striking in a capital anywhere is a bonus for extremists set on undermining confidence in the ability of a state to protect its citizens, or of occupying powers to keep order. Bombing campaigns as diverse as that against the British in Palestine in the mid 1940s, perpetrated by hardline Jewish activists, and that in Baghdad in 2003-2005, which was largely the work of Islamic militants aided by some nationalists and Ba’athist loyalists, show just how effective this can be. The Zionist Irgun’s bombing of the King David hotel in Jerusalem in 1946, which killed 91 people, dramatically demonstrated the organisation’s capability and the weakness of the British authorities. Just over a year later, the British announced they would effectively abandon their rule in Palestine, allowing the state of Israel to come into being. Burke also risibly informs Guardian readers that some scholars would characterise “the Jewish zealots who took on the Romans in early the imperial province of Judea in the first century” as early “terrorists”. So, whilst one bombing by Jewish extremists in 1946 and attacks on Roman targets by Jewish zealots 2000 years ago are cited, thousands of Israeli victims and Palestinian perpetrators (since 1948) are completely erased from the Guardian’s history of urban terror. Furthering “the narrative” a la Kim Ghattas. I am shocked, Shocked! A few observations about the Groan. The Guardian is on the way to going out of business. Burk’s hack piece is already sponsored by the Rockefeller Foundation which likes to support other left leaning press across the EU. The Pals have said over and over again, they don’t want peace, they want to get rid of the Jews, and they try hard to do so. If you don’t think that’s terrorism then you have a screw loose. The one area of human activity in which the Palestinians can claim to be leaders is terrorism. From throwing Leon Klinghofer of a cruise ship to blowing up TWA planes and pizza parlors and university cafeterias to car rammings and knife attacks, they have shown the way for terrorists around the world who have copied their cruel tactics. But its typical of the Guardian to ignore their horrific record in this area. Robert F. Kennedy in June 1968, by a “palestinian” savage. Why did you overlook the following sentence in the article? As for your sentence ‘ “Burke also risibly informs Guardian readers that some scholars would characterise “the Jewish zealots who took on the Romans in early the imperial province of Judea in the first century” as early “terrorists”.’ I believe that Tacitus and Josephus would agree with Burke. As far as the bit about the 2008 attack on the Jewish center, it wasn’t relevant to my argument: that Palestinian attacks on Israelis or Palestinian attacks on Jews abroad were omitted. As far as the zealots, yes, I do believe its quite funny (risible) to omit the last 70 years of Palestinian terror, while including Jewish ‘terror’ from the the First Century CE. Adam I am a bit suprised that you have attempted to give a different meaning, and even add a bit, to the sentences I queried with you. However that is your choice and my original queries stand. The central problem groups that ignore Islamic terrorism where Jews are the target arises relying on an entirely subjective distinction. We are told constant,y that Israel oppresses the Palestinian Arabs who therefore have a “right” to resist by all available means including violence and therefore cannot be terrorists. Yet, that principle somehow does not apply to the Irish who fought against Britain and targeted civilians. They are labeled terrorists yet not only acted in the same manner as do the Palestinian Arabs (except perhaps for their general penchant for providing early warnings to minimize casualties) but were for a long time allied with them for purposes of training and supply. Their guiding principle seems a rather self-involved one: if it’s an attack on Britain in particular or Western countries in general, whether on military or civilian targets, then its “terrorism” – so that covers the IRA, jihadists and even the Irgun bombing of British military headquarters in the King David Hotel, even though the Irgun’s warning was intentionally ignored by the British commander, a decision that increased the loss of life. If it’s an attack on Israel’s civilians, well, that’s apparently something else entirely and I can’t help but think that in part it is due to the baleful continuing effects of the now mostly discredited idea of Christian supercessionism: ever since denying Christ’s divinity, the Jews deserve everything they get. When civilians – as opposed to the military – are targeted, there can be no principled distinction between what happens in Jerusalem versus what happens in Paris, London or anywhere else. It is a huge mistake to pretend that attacks on civilians can be excused under any circumstances because then you fall into the “one man’s terrorist is another man’s freedom fighter” fallacy. In the world we actually inhabit, it is sometimes the case that the end does justify the means, and legitimacy is retroactively conferred on the winning side even if terrorism was part of their strategy. “The Zionist Irgun’s bombing of the King David hotel” – again, the usual Guardian bigotry. It wasn’t a hotel. The King David Hotel bombing was called in repeatedly, to give time for an evacuation. But the Brits did not act on the information. Also a fact that is always overlooked. 1970s and 80s Europe is littered with Palestinians murdering Jews across Europe. 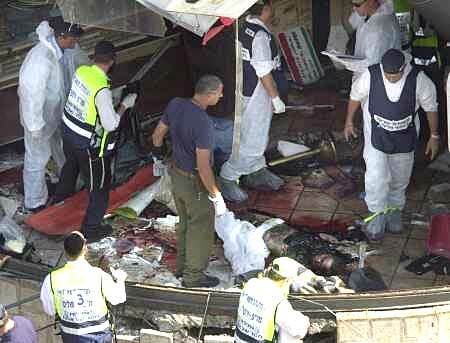 Random bombings and shootings of European citizens who were Jewish. If that is not antisemtic , what is? The King David Hotel was NOT a terrorist attack. The building kept the label ‘hotel’ but was in use as the Secritariat of the Government of Palestine (British Mandate of) and the HQ of the BRITISH ARMED FORCES. It was a classic MILITARY target. What the PLO did in Leabanon post Jordan is also pure terror. They tunred that country into a war zone and kidnapped, murdered and displaced Jews and all those that would not do what they were told. The bio of Gad Saad’s family is a mirror of what happened to people who happened to be Jews but had nothing to do with Israel. According to the IMF that fat rat arafat transferred $900 million of PA money to his personal account between 1995-2000. Nice. See where taxpayers dollars went.